Born in 1951 in Phoenix, Don grew up in Riverside, Calif. He left California to attend the University of Arizona where he was on the golf team. He turned professional in 1973, the year he graduated. He toured the country competing on the PGA Tour and Buy.Com Tour, earning victories in the 1980 B.C. Open and the 1987 Memorial Tournament. He also played in the Tucson Open more than 20 times, with his best finish a tie for fifth in 1997. Don is also remembered from his PGA Tour days for his dramatic “Million Dollar Hole-in-One” at the 1987 Bay Hill Classic. Don received $500,000 for his efforts, as did the Arnold Palmer Children’s Hospital in Orlando. His commitment to helping others did not stop there. 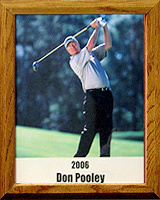 Pooley has played in dozens of charity and pro-am events. He also has held clinics for youngsters and has helped the Tucson Conquistadors whenever asked. After turning 50, Pooley joined the Champions Tour, formerly known as the Senior Tour. His first Champions’ win was the biggest of his career, the U.S. Senior Open. In his rookie season on the Champions Tour he had seven top-10 finishes and won over a million dollars. Don is a deeply religious man and is strongly committed to the Fellowship of Christian Athletes.